This is your riding holiday and French Riding Holidays' aim is that this horse riding holiday should be an enjoyable experience. You will get to see a lot of the countryside and culture on horseback. There is a range of beautiful horses to suit your individual requirements, ranging from the English thoroughbred to the calm and sure-footed mountain horse. The setting could not be much more perfect for a get away from it all holiday, while still combining the fun and excitement of the riding. The Mas de Clamouze offers peace and tranquillity and there is a definite sense of calm. Sitting on the terrace in the evening watching the sunset over the valley can only be described as paradise! Your accommodation will be in a purpose-built gite adjacent to the original farmhouse of Mas de Clamouze. Each chambre is individually decorated in the French style with antique French furniture. French Riding Holidays caters for single guests (no single supplement) and can accommodate groups of up to ten. There is free Wi-Fi available. There are three twin rooms (one to two persons) each with en-suite shower / toilet. There is one family room (one to four persons), a double room with adjacent twin room sharing an en-suite shower/toilet. All bed linen and towels are supplied and each chambre is equipped with a hairdryer. Shower gel, shampoo, conditioner, and toothpaste are provided for those traveling light. The large airy seating and dining areas have sun terraces on three sides overlooking the wooded valley and swimming pool. The conveniently situated swimming pool gives you the opportunity for an early morning swim, a cooling dip at lunchtime, or great relaxation after a day in the saddle. Daily riding time is five to six hours or sometimes a day ride with a picnic or restaurant. Guests can arrive on any day and stay as many days as they wish. French Riding Holidays caters for all abilities and non-riders too. They pride themselves in talking to the guests upon their arrival and planning a tailored holiday for them. French Riding Holidays rides every day and there are no days off although guests can choose to laze by the pool for an afternoon if they would like. There are many varied trails for riding from the Mas De Clamouze. A typical day will be to ride for two to three hours in the morning and in the afternoon, returning to the gite for tasty lunch. French Riding Holidays has day rides where you will sit down to a “formal” picnic by a Moulin or a village green and some of the more adventurous day rides, you will pack up the saddlebags with sandwiches and treats and sit by a river or a forest picnic table. A favourite is also to ride past beautiful chateaux to a local restaurant where they don’t mind muddy riding boots. All the rides will involve some lovely canters and French Riding Holidays has a few fun fast gallop fields. 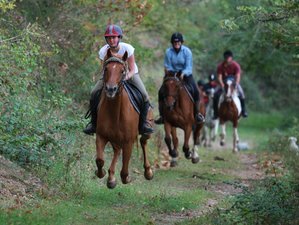 For the jumpers, French Riding Holidays has a cross-country course, cleverly designed for advanced riders one way and the less experienced going the other way. There is also a show jumping paddock. French Riding Holidays also has a TREC course down in the valley. There are a series of obstacles designed to test the obedience, confidence, courage, and balance of the horse and rider. You can try the immobility circle, the S bend, opening, and shutting the gate to name but a few. For groups of riders who are feeling adventurous, French Riding Holidays can organize a pony club games in the paddock and also some “competitive” horse ball a la FRH. French Riding Holidays are experts in providing holidays for horse riders of all levels from beginner to advanced. They have 25 fabulous horses to choose from who are the real stars of the show. The horses are surefooted and forward going and they have chosen them with great care to ensure that both novices and experienced riders can find their perfect equine partner. In the herd, to name a few, French Riding Holidays has English thoroughbreds, Anglo Arabs, Arabs, Selle Francaise, Cremello, Spanish, Appaloosa, a Norman Cob, plus, of course, the own foals. French Riding Holidays has a upper weight limit of 92 kilograms but please do speak to us if you are above this weight and French Riding Holidays will see what they can do. With the horses ranging in height from 14 hands to over 17 hands, French Riding Holidays can cater for adults and children. The tack is English general purpose saddles, very comfortable and customised for each horse. The beautiful Aveyronese countryside has enchanting villages, unspoiled woodland, river valleys and gorges, and rolling plains. The area has an abundance of wildlife and we regularly spot deer, wild boar, dormice, red squirrel, hares, buzzards, and kites. Meanwhile, the Mas de Clamouze offers peace and tranquillity and there is a definite sense of calm. Sitting on the terrace in the evening watching the sunset over the valley can only be described as paradise. Food is a big part of the French way of life and things are no different here. French Riding Holidays prides themselves on providing the very best cuisine and they cater for all tastes and requirements including vegetarian, vegan, and gluten-free. Meals will be provided every day. Breakfast will be at the gite for you to enjoy at your leisure either out on the terrace or around the big family table if you prefer. Lunch will be a leisurely affair to allow you and the horses time to relax before your afternoon ride. Lunch can be provided at the gite round the family table, on the terrace, or outside in the garden. On day rides, French Riding Holidays set up picnic tables and chairs (not the floor) by a moulin or some beautiful fields or village greens. On your return from your days riding, you will be greeted with cold drinks and snacks. Moreover, in the evening, a four-course dinner with wine rounds off your day. Please book your flight to arrive at Rodez-Aveyron Airport (RDZ), Toulouse-Blagnac Airport (TLS), or Brive-Souillac Airport (BVE). Transfers from and to these airports are included. French Riding Holidays will pick you up from the airports. Please confirm with French Riding Holidays before booking an early morning flight or an evening flight (e.g. a flight outside the hours of 10 a.m. until 5 p.m.). The local station is Capdenac Gare, just 10 minutes by car with free transfers. Airport: Toulouse–Blagnac Airport Airport transfer included: Toulouse–Blagnac Airport No additional charges. You can request this in the next step. Airport: Rodez–Marcillac Airport Airport transfer included: Rodez–Marcillac Airport No additional charges. You can request this in the next step. French Riding Holidays is a small English-run business based in Asprieres offering horse riding holiday with a range of beautiful horses.